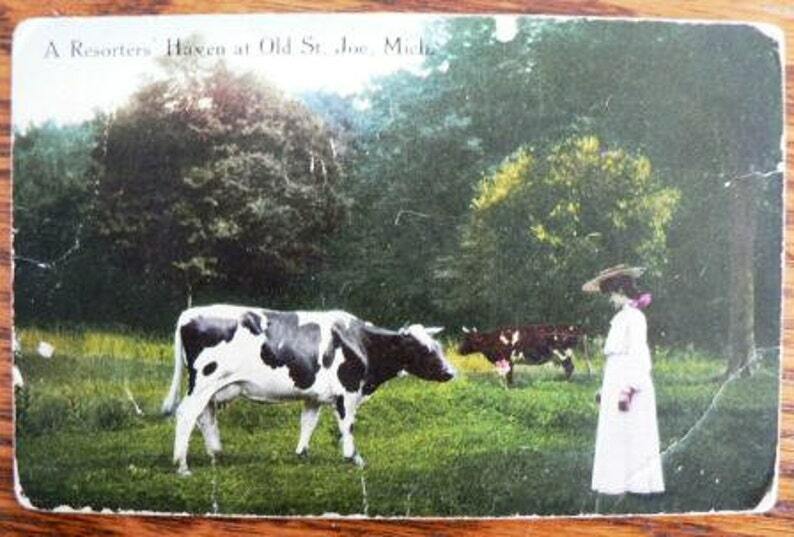 vintage POSTCARDA RESORTS' HAVEN AT OLD St. JOE, Mich. - an amazing vintage image of a pastoral resort! 3.5" x 5.5"
Antique SWEET! this single little beautiful greeting is so vintage darling to offer the perfect greeting with a great vintage get well gift or perfect for your multimedia crafting, scrapbooking, collages, mosaics and creative frenzy! Could be Framed or perfect for that special card to a dear friend! I have many interesting destash supplies and ephemera items both here and in my other vintage etsy stores Inktiques & WritersCraftToo & CndnPrairieAntiques (links in the shop header) - volume discounts/bulk shipping will apply across all of my shops - just drop me a note for coupon codes.